Home > Comet Clutches and Parts > Comet 302470C Drive Clutch for Land Pride (Treker) UTV > Comet 301825-C. Salsbury 704140 Replacement Belt > Comet 302649C Driven Clutch. Comet Industries 770 Series Driven Clutch (Lower Pulley): 7/8” bore. 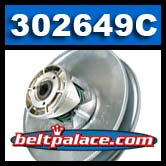 Comet 302649-A/C Driven Clutch. Comet Industries 770 Series Driven Clutch (Lower Pulley): 7/8” bore. Comet 302649C Driven Clutch. Used in Feterl Pug ATV/UTV’s and others. Comet Industries 770 Series Driven Clutch: 32 Cam, Green Spring, 7/8” bore. Requires 1-3/16” top width belt. 1700 rpm engagement. ONLY 2 (TWO) LEFT IN STOCK: ORDER NOW! OEM: 770 DVN- 7/8" B - 9.84"Dia, 1-3/16" TW, TROWEL. 3/16" KEY. 32 Deg Cam, Green Spring. The Comet 302641 ATV Belt is an exact replacement for Comet Industries belt 302641A. Replaces OEM Comet Feterl Pug & ATV's torque converter belt. Measurements: 1-3/16” Inch Width, 51.79 Inch Length. 2-Sided Cogged belt. A popular size kevlar reinforced Cargo All-Terrain Vehicle belt, ATV clutch belt, People Mover clutch belt, and Go Kart drive belt.